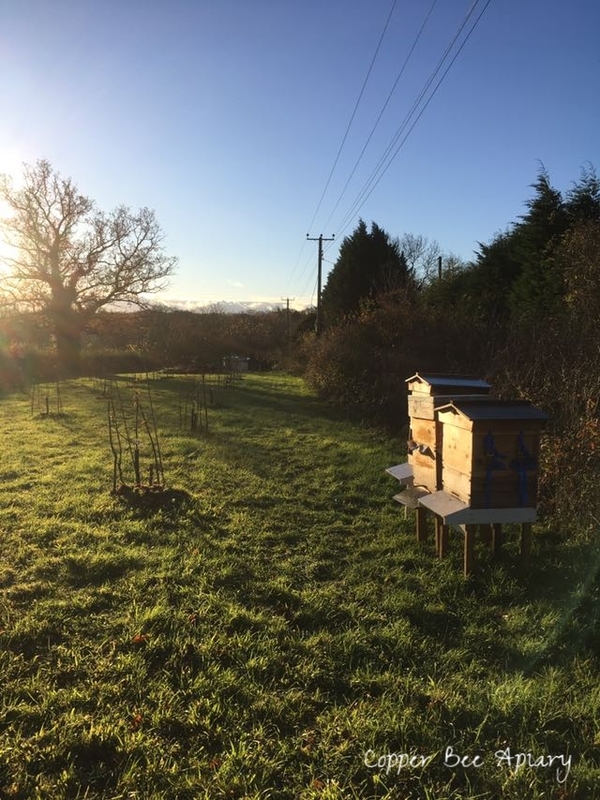 We took the bees on their winter retreat to the orchard last weekend. All seemed to go well - no hives got dropped while being manhandled from garden through house to trailer, no hives shook loose from their ties while travelling down the motorway, and no hives fell off the wheelbarrow while being bumped through the apple orchard in the dark. But there is something unusual to report. We moved all of what is now our total of three colonies: the strong and cheerful colony of Queen Mab, the quiet and studious colony of Queen Lois, and the recently united colonies of Queen Katherine and Queen Nefertiti, headed by the latter. Moving the first two hives was uneventful. Moving the third was noticeably different - the bees roared. 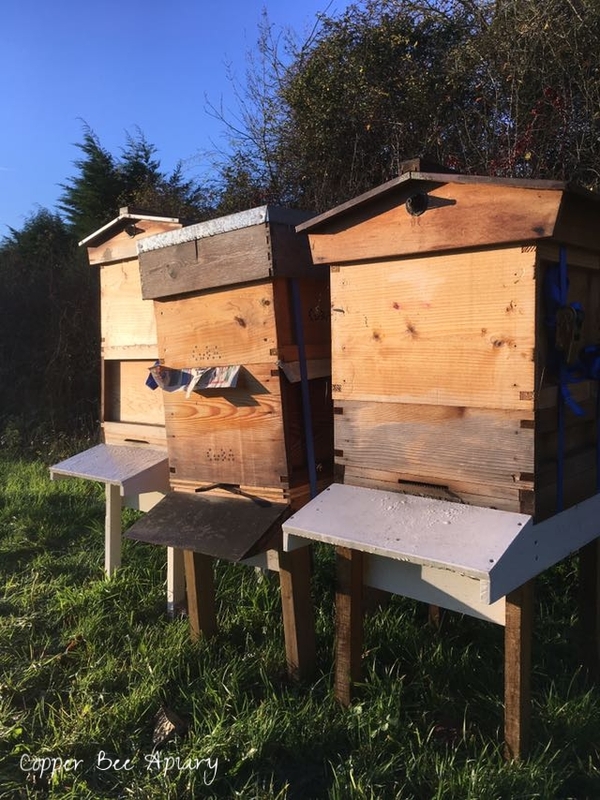 They roared as we carried the hive through the house, they roared on the trailer, and they carried on roaring after we set the hive down on its stand by the hedgerow in the orchard. Those bees are in a rumpus! 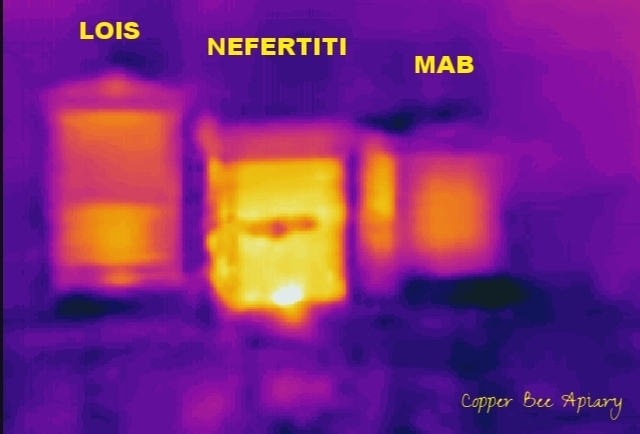 The white hotspot is their open front door. The darker area in the middle of their hive is the remains of newspaper sticking out of the front, left over from the uniting. I fear their tumult is a bad sign. Queenless bees are said to give a sustained roar when disturbed. But there's one way to find out...wait for spring. The beehives look very much at home there. Let us hope the bees enjoy their holiday and come through the winter well, ready for next year's adventures!